Canopy Growth recently secured the largest strategic investment in the cannabis space to date, with the investment received from alcohol giant, Constellation Brands. Keep reading to learn more about Canopy Growth’s SEO practices, and possible areas for it to improve. Many of the concepts have been used when marketing cannabis business clients at Hiilite. We need to first understand that Canopy Growth may not exclusively depend on organic search engine traffic to communicate its vision. SEO is a tool that can be utilized by businesses to extend their audience by capturing relevant visitors who are already searching for a business’ offering. Because Canopy Growth is such a giant within the ever-growing cannabis industry. Many of the people consuming it’s content are already interested in the financial health, investment opportunities and news. This demographic is likely to already be aware of the avenues of which to find the necessary information. Thus, SEO may not be very high on Canopy Growth’s marketing priorities. However, it may be a worthwhile pursuit for the cannabis giant. Conclusion: It does not appear that utilizing SEO services is at the forefront of Canopy Growth’s marketing strategy. Recommendation: Determine (internally) if increasing the number of website visitors who may currently be unaware of the company and evaluate the potential ROI that can result from implementing a SEO campaign. Running a site-wide crawl will help ensure that we identify troublesome trends and/or practices and allow us to prioritize as necessary. Tools like Screaming Frog are simple to use and provide (almost) immediate results. Conclusion: Screaming Frog crawl has identified potential onsite elements that should be analyzed to improve onsite SEO. Recommendation: Follow up on notable SEO elements hindering websites performance. An integral factor for ranking highly on Google and other search engines, is ensuring the right keywords are being targeted. Broadly speaking, a well-established brand can potentially get away with targeting highly competitive keywords, where as a new business should look to target less competitive keywords. How does our client’s site stack up against those that currently rank on page one for a given keyword? Is the keyword relevant to the audience we are trying to target? Does the keyword portray intent? Conclusion: Canopy Growth currently ranks for 510 keywords, which is great! However, the keywords they are currently ranking on the first page for are branded. For example, they currently rank first for ‘canopy growth corporation’. Keyword search forecast tools suggest this query receives between 4,300 and 6,500 searches per month. Trying to increase their search engine ranking for a broader range of non-branded keywords would be a great way to expand their audience. Recommendation: Conduct extensive keyword research and competitive analysis to identify which keywords to try to rank for. Audit the existing keywords do they match up well with what a cannabis company would be showing up for? Or are they showing up for ‘Calgary Roofing‘? Begin to incorporate these keywords in to onsite SEO elements. During this step of the audit, SEO consultants are looking to confirm that keywords used by a client are relevant. The easy way of doing this is to identify the keywords our competitors are ranking for. There is no need to reinvent the wheel in many situations. Conclusion: For the sake of this article, we identified ‘cannabis companies ontario’ as a keyword that is relevant to Canopy Growth. 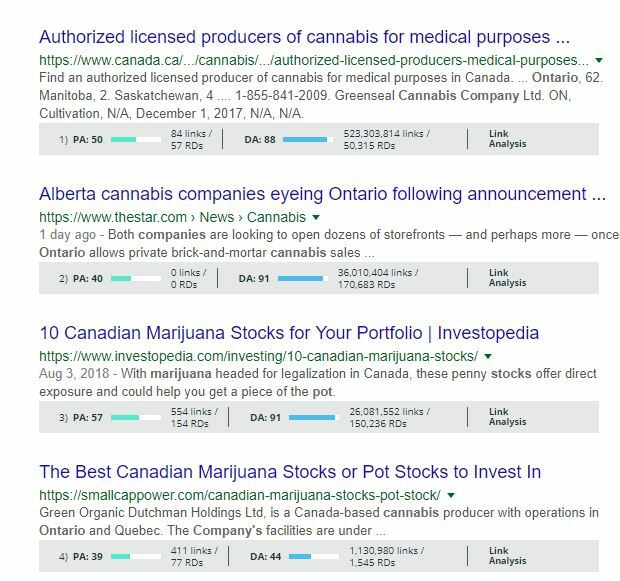 However, company websites like https://www.auroramj.com/ and http://supreme.ca/ rank comfortably on the first page while Canopy Growth is located on the second page. As an experienced cannabis marketing agency, we would identify this as an area that there is potential for improvement. Recommendation: Continue the exercise outlined above for a variety of keywords, identify any low hanging fruit (easy keywords to rank for) to pursue and implement them into your SEO strategy. The first three results have incredibly strong link profiles as well as domain authority. This suggests to us as a Calgary SEO firm that it may be quite difficult to outrank these sites for the top three results. Conclusion: Strong websites in terms of link profiles and domain authority will be difficult to out rank unless our client’s site is just as authoritative. Recommendation: Decide whether the investment of time and resources is available to attempt to rank for the competitive keyword. If it is, begin implementing the keyword into key SEO elements. In this step of the audit, SEO experts are determining whether there are behind the scenes factors that may be negatively impacting a client’s search engine performance. 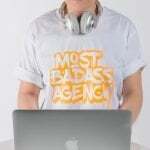 At this stage, there is a few concepts that may be beyond a beginner SEO skillset. Based on this report, we can safely assume that site speed is not currently an issue. Next, we want to discover if there are any redirect issues. Redirects of pages (if not done correctly) can impact the user experience, as well as reduce the authority of a website. Canopy Growth scores well here as 92% of the URL’s crawled in our audit receive a ‘200’ (OK) status code. Those with ‘3xx’ (redirected) codes should be evaluated to remove any unnecessary redirection chains and/or ensure ‘link juice’ is properly being passed. Search engines such as Google utilize a websites sitemap file to better understand its architecture and subject matter. Canopy Growth’s site utilizes a sitemap. Additionally, the robots.txt file on the website does not disallow crawlers such as Google from indexing the site. Google currently has about 323 results indexed. Google dislikes duplicate content of any kind. For our audits, we will evaluate the websites content/text as well as the META data present in its source code. With 14% duplicate content found, there is room to make some of the pages more unique and further improve their search engine performance as a result. Taking another look at our Screaming Frog crawl report, we notice that 48% of their page titles are duplicates. This is something any Calgary SEO company would be looking at changing. Not only does this stop these pages from competing against each other for the same search term, but by making them unique, it also allows Canopy Growth to (potentially) rank high for additional keywords. The Screaming Frog crawl report, indicates that 98% of the pages crawled do not contain a meta description. To SEO Analysts’; this is like leaving money on the table in a negotiation. Meta descriptions are a great way to summarize the contents of a page, further enticing the searcher to click. Conclusion: Technically sound website with relatively few significant issues. Recommendation: Although a technically sound website, there are areas for improvement including optimizing the URL structure. A review of the duplicate and less than optimal meta data should be prioritized. 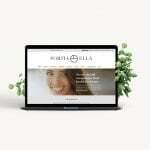 This process, will ideally combine quantitative data (Google Analytics) as well as qualitative data (feedback from users) to understand how people interact your content and website. The goal here is to review these metrics and optimize the user experience based on our findings. Because we do not have access to Canopy Growth’s analytics, we will be focusing more on our qualitative observations. Conclusion: Without access to analytics it is difficult to assume whether Canopy Growth’s visitors are interacting with the site to a degree that lines up with their strategic goals. However, there are notable findings from strictly a user experience perspective that can be improved. Recommendation: Depending on website goals, a strategy could be devised to encourage conversions such as downloadable reports, contact inquiries, etc. As discussed in the very first level of this comprehensive audit, it is important to consider Canopy Growth’s strategic objectives when conducting an exercise like this. Clearly Canopy Growth relies on avenues outside of SEO to drive awareness and traffic. However, it can not be understated how despite a very successful cannabis company, there is still potential to grow utilizing the above strategies. 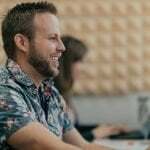 Can our Calgary SEO team audit your website to discover how you can improve your online presence?